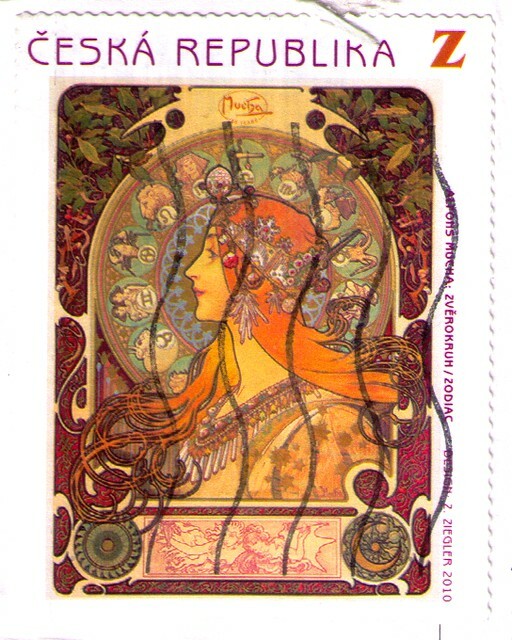 This incredible Alphonse Mucha stamp recently came to me on a Postcrossing postcard from the Czech Republic. I'm a Mucha fan, and this truly delighted me! It has zodiac imagery, and the stamp is titled "zodiac." I can't tell which zodiac sign this lovely lady is representing (is it Libra, because Libra is on the top here? ), but it has a warm, autumnal feel in the mood and colors. Love that stamp! Maybe she isn't a specific zodiac sign, but the zodiac in general? I received the same stamp today. And the card was showing the same picture. It's so lovely!